ABOVE: After collecting your bags at CDG, you'll need to find your way into the city. Need a hotel near CDG Airport? 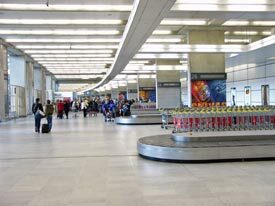 Charles de Gaulle Airport (CDG) has connections to more foreign destinations than any other airport in the world. Unless you're arriving in Paris on a budget or domestic airline, you'll probably fly into CDG, which is located 23 km or 14 miles from central Paris in the suburb of Roissy. You have a number of options for reaching the city from Charles de Gaulle Airport. The cheapest is the RER train, which has several stops in central Paris and connects with the Métro system. This is a good choice when you're traveling with light luggage. If you're loaded with bags, we'd suggest an airport bus or--for direct transportation at a higher fare--an airport shuttle or taxi. For information on each type of ground transportation, go from page to page in this article or use the navigation table below. Note: Although we update this article regularly, fares are always subject to change, so click the related links to visit the official Web sites if you need to check prices.